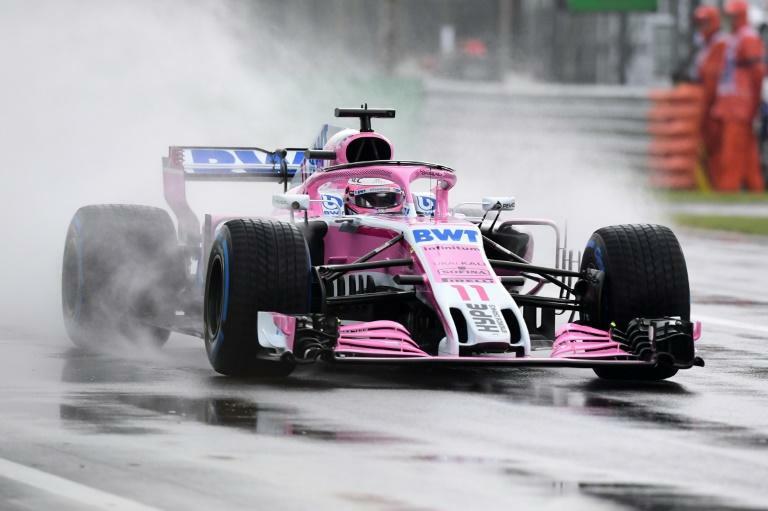 Sergio Perez topped the times for the reborn Force India team in Friday's rain-hit opening free practice session for this weekend's Italian Grand Prix. The Mexican clocked a best lap time of 1min 34sec to outpace nearest rival Kimi Raikkonen of Ferrari by 0.550 seconds with his pink-liveried team-mate Esteban Ocon third. The team is to be known as Racing Point Force India after a takeover by a consortium led by Canadian billionaire Lawrence Stroll. The Silverstone-based team landed their impressive times in the closing seconds of the session when they were virtually the only cars on a drying track. Brendon Hartley was fourth fastest for the local Toro Rosso team ahead of Daniel Ricciardo of Red Bull and Pierre Gasly, the Red Bull-bound driver in the second Toro Rosso. Max Verstappen was seventh in the second Red Bull and Carlos Sainz eighth for Renault ahead of team-mate Nico Hulkenberg and Valtteri Bottas of Mercedes. Championship leader Lewis Hamilton, who finally arrived at the circuit on Friday morning on a scooter after missing Thursday’s media activities due to an "unavoidable personal commitment", was 11th in the second Mercedes while his title rival Sebastian Vettel, who is 17 points behind in the drivers’ championship, was 17th. Both men restricted their activity, Vettel doing only four laps, and changing his gearbox, and Hamilton doing only six. Bottas did only eight. Ricciardo and Renault's Nico Hulkenberg have both taken new engines this weekend and both will start Sunday's race from the back of the grid. Overnight thunderstorms had left the Autodromo Nazionale Monza littered with deep puddles before the session with intermittent drizzle adding to the miserable conditions. Ricciardo suffered a power problem on his first lap but after some software repairs he was able to rejoin the fray.